We found a goat we thought we might be interested in, and I emailed a few of our close friends and family members to share a cute picture of what I thought would be our new pet/milk provider. My (step) dad emailed me back and told me he wanted to buy it for us. 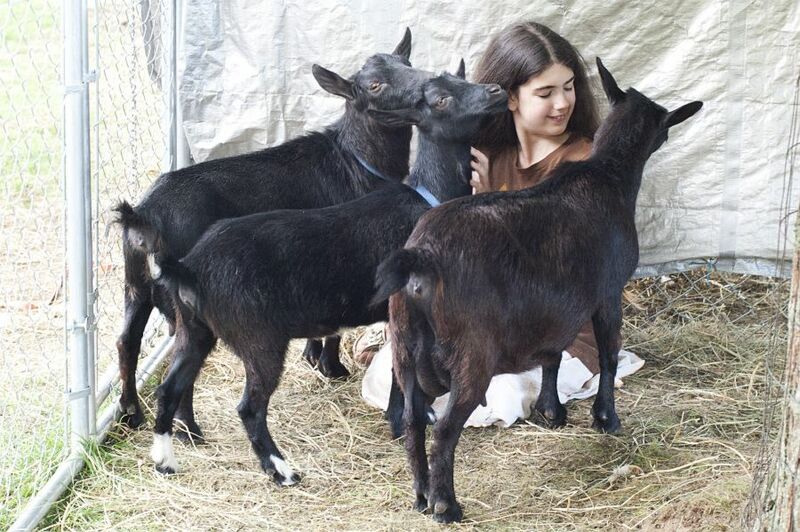 Meanwhile (before I’d seen the email), we found a breeder who was selling her herd of five Nigerian Dwarf goats. As we talked about the possibilities, it came to our mind that we could use these animals to bless other families (read the full story here.) I decided to ask my (step) dad if he would loan us the money to purchase this small herd. Long story short, he refused to loan us the money and instead gave us the money for all five of them. A few days later, my dad and brother gave us the money for the fencing. A few weeks after that, a friend of ours volunteered to make houses for them and then later made us some hay feeders. Then another friend built us a fodder system so that we could supplement them with fresh greens during the winter. A few months later, I happened to be looking on craigslist and saw someone selling some sheep very inexpensively. I spoke with Jon, and we decided to purchase a few of them to butcher in the fall. Technically, however, we didn’t have the money for them and we both really hate going into debt. Nevertheless, we decided to do so, because we felt we could provide a need for our family very cheaply by raising and processing them ourselves. In the meantime, I had contacted Suduko’s breeder to let her know that we wouldn’t be taking the buck, and asked if we could transfer our deposit to a doeling from Suduko in the future. Long story short (you can read the full story here), it turned out that they had just made the difficult decision to sell all of their milking animals and Suduko HERSELF was available! She agreed that not only could we use that deposit toward Suduko, but she asked if she could TRADE us for some sheep! And Suduko is already bred and will be delivering kids in the fall! Yesterday, our neighbor told my husband that he is willing to lease land to us (we’ve asked him before, and he has said no) and my (step) mom offered to help us with monthly payments on the land, if we need it. And a friend emailed and told us he wants to buy us a cow. I told my mother-in-law the other day that at some point, I’m going to stop being surprised by all of this. This entry was posted in Farm & Garden, PERSONAL, Victory Journal. Bookmark the permalink. I know I’m blowing up your comments but, I’m so encouraged by your stories of God’s faithfulness to provide. We’re in a similar position… not knowing where the money will come from to do the things that are in our heart to do and get and care for the animals we need to get there but, I know God can do it. Thanks for sharing. Please don’t feel like your commenting too much, I love it when people comment and I get to hear their stories! I’ve met so many wonderful people through this blog, I’m just sorry it’s taken me so long to respond to you! Do you have a blog?